I was recently checking out the popular songs on iTune and noticed that most songs were void of any obvious guitar. Almost all of the tracks were based on beats with bass, synths, piano and vocals. A few tracks had acoustic guitars being strummed in the back ground or a funky rhythm guitar like Maroon 5's latest song but guitar was rarely noticeable. I decided to do some research to find out if guitar was losing popularity rather than just making a conclusion based on the iTunes top 100. Google are on a mission to scan every book ever written into digital format. To date they have over 5 billion words scanned. Having all these words connected to dates makes for some pretty serious data. I discovered that some clever minds at Google labs have created a program called Ngram which is now available to anyone to run the frequency of a word over time. In effect this gives a very accurate picture of how popular a word was at a given time in history. This in turn can tell us how popular something has been over time. Perfect! 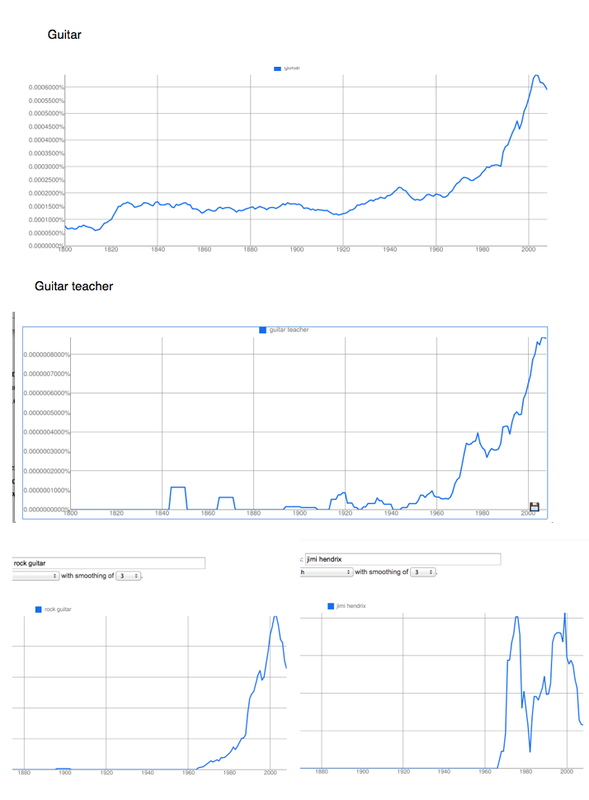 Now I was able to enter some keywords and find out how popular guitar has been over the last 100 years or so. I initially typed the word guitar and you can see it really started to take off in the 60's but prior to that was probably about as popular as any other musical instrument. Piano by contrast peaked in the 1940's and dropped quite dramatically by the early 60's. Guitar had obviously taken over. Guitar's rise to the top was probably a combination of factors but my guess is The Beatles had something to do with it. 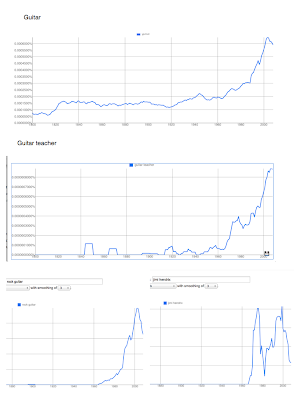 BTW - I have included a few extra Ngram searches. 'Guitar teacher' as you can see has not seen a decline. Guitar teacher is peaking and may still be rising. Rock guitar peaked in 2001 and dropped sharply after that. Jimi Hendrix peaked in about 1970 almost disappeared around 1980, rose to a new high in 2000 and has dropped away sharply ever since. Interesting! Guitar reached its peak in about 2001 and has declined in popularity (although only slightly) ever since. One might conclude that guitar is on the way out but I beg to differ. I believe guitar is about to boom again as I will explain. From what I understand guitar became popular in the 60's because of popular music but the question is why did popular musicians choose guitar? Pop music of the 50's and 60's was based on blues and blues was mostly played by African Americans who simply couldn't afford to buy a piano. Guitar no doubt came up through Mexico. Blues had been around for sometime but when electric guitars came on the scene the rock n roll revolution began. Even so what really made the guitar popular when you stand back was its convenience and price tag. No other instrument was able to give singers the backing they needed at the low price and pure convenience of the guitar. Pianos were expensive and inconvenient. Almost all other instruments were ineffective when it came to backing up singer. Guitar's convenience won out. So what's happened since 2001 and why will the guitar rise again? I am going to answer these questions in my next blog so stay tuned.